The day was cold and dreary. The clouds were getting thicker and the sky was heavy with the promise of snow. We walked through the park at a fast clip anxious to get home. It was actually the type of weather I love.....moody and gray. That is when hidden color really comes to life! I had my camera around my neck and quickly shot photos as we passed through the park. I have returned home to Georgia missing my grandbabies but filled with inspiration and excitement. 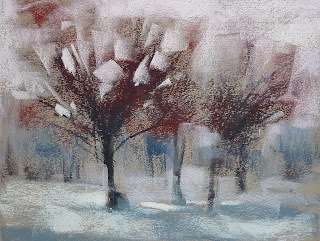 The first thing I decided to paint was a scene from the walk in the park. 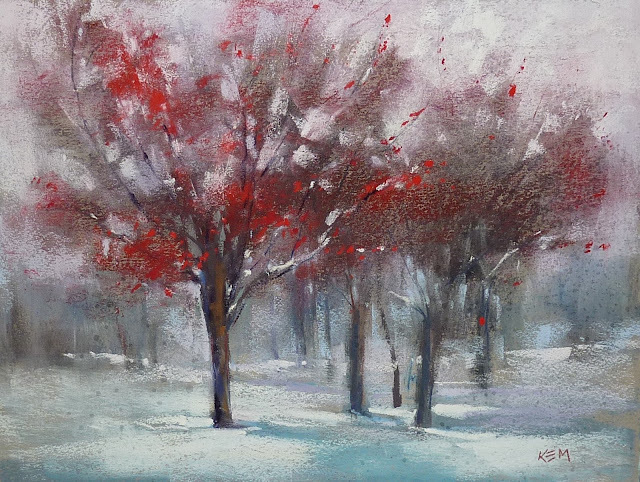 I loved the little trees with the bright red berries. They teach us an important lesson about color. All Color is No color! If you want a color to stand out...to pop or sing...then it is important to surround the color with duller or neutral colors. This provides the stage so the main color can be the star! Mother Nature does this! All we need to do is look and we will see it. 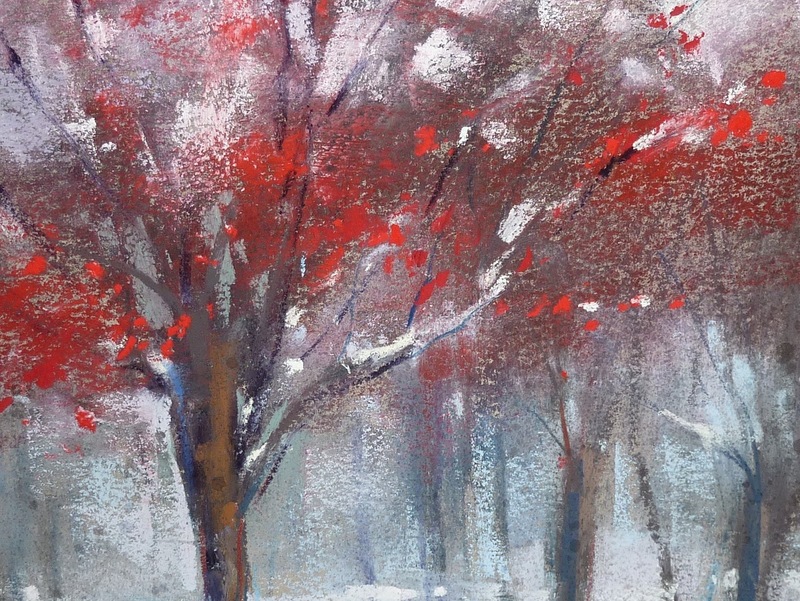 Follow along my step by step demo to see how I made the red berries the star of my painting. 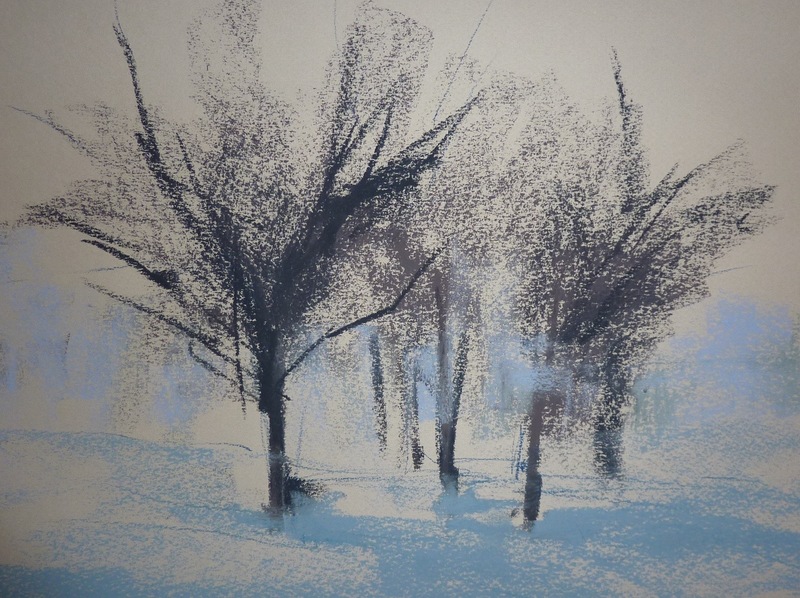 The block in: Roughing in the trees with a dark dull violet and some gray blues. I am using Canson Mi-Teintes paper. 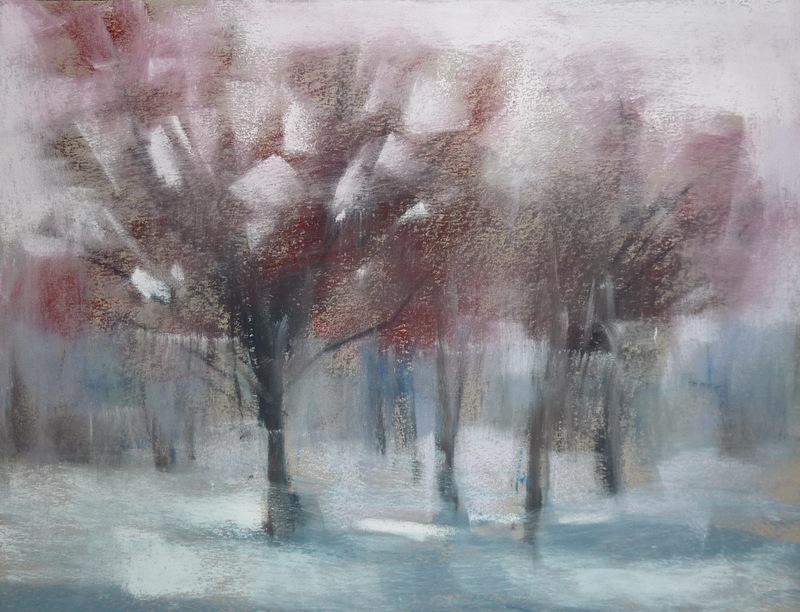 Adding some dull reds to the trees and some pale pinks to the sky. I am also adding some dull pale pinks and violets to the snow. 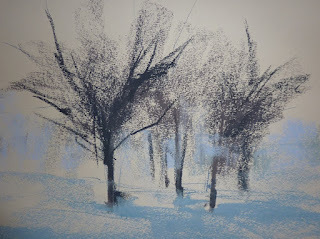 I indicate a few branches with a dark blue pastel. I blend in this first layer of pastel to add some soft mystery. I paint the bare trees by blocking in a mass then carving the branches with sky color. Now I add a brighter red by using a brick red pastel on it's side. This isn't the most intense red I will use. I am gradually building up to the bright red berries. I also develop the snow and shadows on the snow. So far everything is still on the dull side! 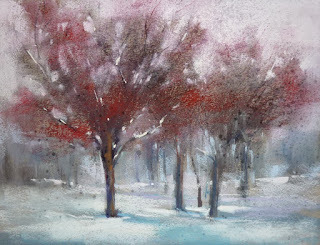 I spray the trees with Blair workable fixative so that I can get more texture in the trees. I also add some snow on the branches. The next step is to finally add the brightest most intense red for the berries. I use soft Schminke pastels in a cool red and a warm orange red. I make a few 'berry' marks and call the painting finished! It's great to be back in the studio! Thank you all for your patience while I took a Grammie break from the blog! Wow, this is beautiful. Love the variety of textures you got on Canson Mi-Tientes. You really captured the heavy cold wet atmosphere of that kind of snow, brrrr! Brought back some memories of Lincoln Park in Chicago. Just lovely, Karen! And I learn much from your step by step lessons. Also, congratulations on the birth of your grandson!